What kind of modifications did you make to your home directory configurations? I’m getting the exact same errors when I have home directories set up on an external RAID array. My user account share points are on two separate hard drives from my server system. Both of these drives are set to mirror each other using RAID. Also, I’m only using Open Directory, because there are no Windows clients in my labs. For me when I was getting this error message the first thing I did was check to logs to make sure that the firewall wasn’t blocking anything and to see if the client was communicating with the server at all. It quickly became apparent from the server and client logs, that the client was actually authenticating without a problem. 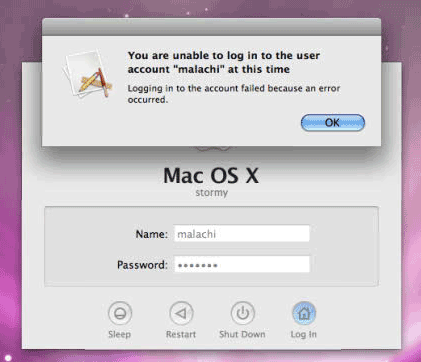 The error was happening at some point between the actually authentication and login. This is what originally led me to question whether the home directories were set up appropriately. Here is what solved the problem for me. After starting the Server Admin application I went to SERVER > Settings > Access > Services. Here the AFP service had only been enabled for the server admin. After setting this to Allow all users and groups the login worked. Choose your Users share point. Choose your Share Point Protocol. should then show your domain. now enter the domain’s admin user name in the name box and the password for the account in the Password box. now click the “Save” button on the bottom right corner of the Server Admin Window. Test account(s) should work now. I found you may need to point accounts to NFS path to home folder if switching from AFP and vice versa. “Here the AFP service had only been enabled for the server admin. After setting this to Allow all users and groups the login worked.5. Shawn D. K.” How much is it true? I have set up new users on my Apple Server, using Open Directory. If I use the server as a machine, I can log in with the new user details, but i cannot do it from another machine on the network. On the users machine, I have set Login Option to allow network users to login, and even specified the user, instead of allowing all network users. Any help would be greatly appreciated. It sounds like you are not creating your users in the right directory. 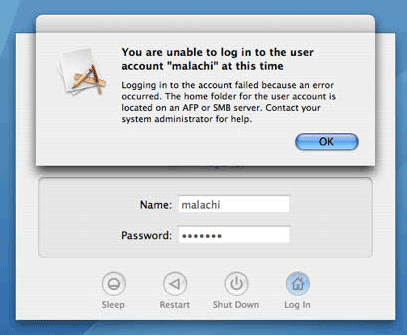 If your users are able to log in to the server, then you are probably setting them up as local users on the server. On the server, you should be setting your users up in a shared directory, like LDAPv3. It shows up as LDAPv3/127.0.0.1 in WorkGroup Manager. Once the users are created in the correct directory, you also must tell the clients to look at the server’s directory when users log in. You do this using Directory Utility on the client computers. You must add your server to the search path. Try reviewing the Apple Open Directory user manual. Also, wasmacdotcom has some really great guides for doing this kind of thing. All my clients point there OK. I have one client that is working fine, new users can log onto from machine no problem, it’s just the other machines on the network so it must be a local thing. I have checked the login items, allowing network users, and even specifying the new users. That let’s you input the name and password, and obviously works, but then stumbles. If you put the wrong password then it shakes, so that part is working. Now I’m lost, as i looked at both machines and all settings seem to be the same! Any further ideas of something I may not have set? Lost!